I used to have this friend who was always unnerved being around folks speaking non-English languages, convinced that they were talking about her. This magnet, given to me by someone else, reminds me of her, because I could have sworn they got it in Beijing, and that's what the writing says. It doesn't. Then I thought it said panda. It doesn't. So, I haven't a clue what it says, and I just hope it's not something about me. Hahahah. I picked this magnet today, mainly because I forgot to do a magnet photoshoot before leaving NYC, so all I have are the magnets already loaded in my photobucket, and this is the most Christmassy festive of the bunch. But, also because Save the World Sister got her usual fill of pandas for Christmas. 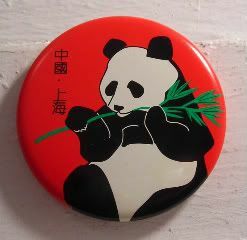 It's so funny, I remember at one point in her apartment, everywhere I looked, I saw another panda item. Things haven't changed. And yep, we've already done Christmas. It's what we do - head straight home after Midnight Mass, jump into our jammies, and open presents. This year was a little weird, because after the snowstorm in DC, we decided it was easier for us to drive down to NC, rather than have our parents deal with the crappy roads (see yesterday's post for validation). So like Santa, we threw all our presents in the big red 4-runner, and headed for the open road, singing Christmas music all the way home. But, home too late for Midnight Mass. So, we just jumped into our jammies, and did our Christmas tonight, in a proper showing of commercialism and consumerism cause and effect. Heh. Now everyone's asleep...except for me, who drank a Mountain Dew at 9 to keep me awake driving home. Ooops. I know, middle of the night to open presents is weird, but this stems from years of practice. In fact, the saddest Christmas ever for me was the year I stuck to my guns, forced myself to go to sleep on Christmas Eve, in order to have a proper Christmas morning opening presents. Only, amidst piles of discarded wrapping paper, my presents were the only ones under the tree. And I was the only one opening presents. By myself. Cuz everyone else was asleep. Silly. Opening presents Christmas morning, instead of Christmas Eve. Who does that? Yay, thanks for the clarification, Erika! Shanghai, China. Awesome. It reads: "China" and "Shanghai". Because Ro found this for you in Shanghai, China. Oh shucks, I was so excited when I thought I could tell you what it said. :) Oh well, I'm glad you know now! Merry Christmas! Heh. Thanks, both of you! Don't listen to them. It actually says "Made in Dayton, Ohio. Silly tourist."